Winter has finally concluded for the year and now is the time to start preparing your spring vegetable planting for gardens. Some easy to steps will help you ease into planting your inside seedling and bulbs to transitioning to the outdoors when the temperatures are just right. Spring is the perfect season to clean your garden beds, remove dead leaves as well as winter pruning of tree limbs or stems. If need you can use this debris for a compost pile or bin. Remove old weeds by their roots to prevent their re-growth. When disposing of weeds, do not throw them into a compost bin or pile. Weeds can germinate in the compost pile and be reintroduced to your garden. Organize your tool shed so it will be easier to find the things you need readily during gardening season. Testing your soil for deficient nutrients and soil type will correctly identify your soil’s need. Many cooperative extension services provide local residents with soil testing for a reasonable rate, additionally you purchase a do it your self soil test kit at your local lawn and garden store. Nitrogen rich soils work best, but soils can be too acidic or too alkaline. For balanced soils consider amending your soil with organic materials, such as compost, worm castings or well-aged manure. For unbalanced soils you can purchased fertilizer specialized for the soil imbalance. Begin with growing cool-season vegetables such as arugula, lettuces, peas and cabbages. Plant tomatoes and peppers from seeds indoors about two months before the last frost. Follow up and allow seedlings to adjust to outdoor conditions before planting them in the garden. Divide perennials before spring growth for best results. Mulching will reduce weeds, mitigate diseases, save water and keep soil temperatures constant. Water soil before applying mulch, and again water after mulching. Avoid placing mulch a few inches from the plant stems to prevent root rot. 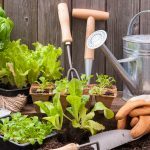 The simple and easy steps to preparing spring vegetable planting will help jump start your garden yield and consistency.